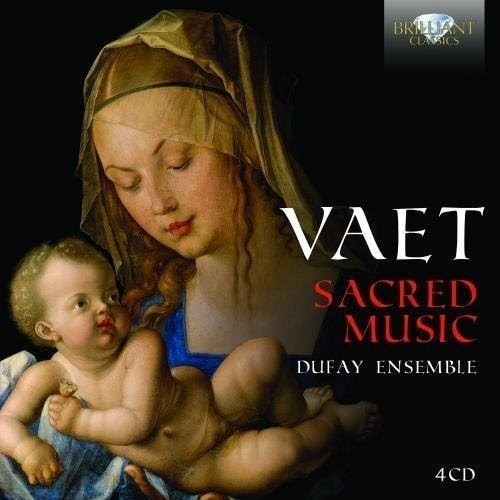 Another Lowlander who worked for Charles V, the four-CD recording of Vaet's sacred music featuring the Dufay Ensemble is finally available. NOTE: All of the music on this program comes from the four-CD set dedicated to Jacobus Vaet featuring the Dufay Ensemble. It is on the Brilliant Classics label and is CD 95365. Composer Jacobus Vaet is first mentioned on the rolls of a church in Kotrijk in 1543; he is identified as being 13 years old and accepted as a boy chorister. Three years later, his voice broke, but he was able to transfer to the University of Leuven with a scholarship. By 1553, Vaet is in the service of Archduke Maximilian of Austria as kapellmeister and based out of Vienna. In 1564, the Archduke succeeded his father into the role of Holy Roman Emperor as Maximilian II, placing Vaet in a very powerful cultural position. Nevertheless, he would not enjoy it long, as Vaet died in early 1567 at about the age of 37. His death was noted widely among court poets and composers throughout Europe, and even by the Emperor himself in his private diary, as Vaet had not only led the music in Emperor Maximilian's court, but also was a valued and trusted friend. Vaet was also among the last generation of composers belonging to the so-called "Franco-Flemish School" of polyphonic music that began with Dufay. Vaet was a specialist in the realm of the parody mass. He is credited in some sources with inventing the Missa quodlibetica, an assembled mass setting that combined a variety of pre-existing melodies into a single texture. His sources for melodies included his own melodies in addition to many of his most famous contemporaries. Vaet was close friends with composer Orlandus Lassus, and the two composers seem to have influenced each other; at one time Lassus' Missa "Si me tenez" was thought the work of Vaet. Vaet also was a great admirer of Jacob Clemens non Papa and Vaet's memorial to him, Continuo lachrimas, provides one of the few clues to what may have been an unnatural end to Clemens. Unfortunately, Vaet's extant worklist is nowhere near as extensive as that for Clemens and Lassus; just nine mass settings, two books of motets along with some scattered individual ones, settings of the Salve and Magnificat, nine hymns, and three secular songs. From MusicWeb International: Brilliant Classics are to be congratulated for their many compilations of earlier recordings. The individual CDs which make up this set were originally available individually on Ars Musici at full price. It is invaluable to have all these works as a single set, for less than the price of a single full-price CD, especially as Vaet is a composer so worthy of exploration. William Boyce said of Handel: “He takes other men’s pebbles and polishes them into diamonds.” Handel was – in days when no copyright existed – always happy to seize on a good tune and work with it in his own music. If anything, this is even more true of Vaet: he would take popular tunes and use them in themes in his religious and secular works. In days before recording, this makes sense, as it is so much easier to pick up and follow the familiar when listening either in court or church. Vaet was Kappelmeister, from the age of 24, to Archduke Maximilian of Austria, who would become Emperor in 1564. His background was as a chorister and singer, but he was clearly a composer of substance. An interesting feature of his music is the quality of word-setting. He seems not to treat polyphony as an end in itself, but as secondary to its purpose, whether of adoration or, as in the final piece in this set, the praise of a secular ruler. The titles of each CD refer to the main work, but each represents a variety of music. For example, the Marian Ave, maris stella (‘Hail, Star of the Sea’), a most unfunereal work, appears on the first disc. The Salve Regina disc contains three secular motets in praise of the Hapsburg dynasty. Perhaps most enjoyable are the six Gospel motets on the final disc - the word-setting in Dum steteritis is an example, with the phrase ‘in illa hora’ (‘in that hour’) repeated like a church clock as a reminder of temporality. Overall, then, this set is one which will interest anyone who loves the music of Palestrina or Gombert, and extends our knowledge of sixteenth century music, as well as of an under-represented and underrated figure.